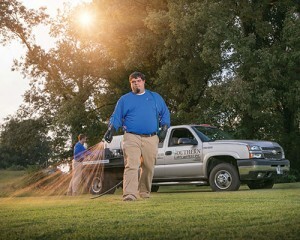 Adding a mosquito-control service proves to be a business booster for Memphis, Tenn.-based Southern Lawn & Pest. The Great Recession nearly brought Steve Clark’s lawn mowers to a halt. At the time, he owned a Memphis, Tenn., commercial lawn maintenance business called Southern Lawn Care. The business, which he started in 2005, grew quickly. But by 2010 revenue had dwindled. Clark had relied too heavily on a few large, commercial clients. Early on, he saw the need to diversify his offerings, but he didn’t act quickly enough. “I realized that we needed to offer weed control and fertilization as part of our service mix because we were leaving a window open for other companies to come in and build relationships with our customers,” Clark says. Clark has since changed the name of his company to Southern Lawn & Pest and launched a Mosquito Joe franchise as a subsidiary in 2013. The addition of the mosquito-control services opened Clark’s business to a new customer base and provided him with invaluable marketing resources. As of press time, Clark expected revenue to reach $315,000 in 2014 with about a third of that from Mosquito Joe. It’s a considerable jump from his low point when revenue plummeted to $69,000 in 2010. It was $280,000 in 2008. That experience taught Clark the importance of developing multiple revenue streams and the value of marketing support. Until 2013, Clark, now 32, was living two lives. During the day he was an agriculture and biology teacher at a local high school, while he managed Southern Lawn in the evenings and on the weekends. His days started at 4 a.m. and ended around 10 p.m. The teaching job helped Clark endure his toughest year as a businessman in 2009. Clark had lost his two largest commercial clients, which nearly sunk the business. In February 2009, Clark sold his mowing division and focused on marketing his lawn care services to the residential market. He spent the next two years working to pay off debts he owed on his maintenance equipment. His business is now 95 percent residential and 5 percent commercial. In 2013, he added perimeter pest control services and changed the name of his business to Southern Lawn & Pest. The pest control service accounts for approximately 3 percent of the company’s revenue. The growth of the business allowed Clark to finally leave his teaching job in 2013 to focus full time on the lawn care and the pest control businesses. Last summer, an outing at an outdoor concert sparked Clark’s interest in controller mosquitoes. He noticed the pests weren’t as ravenous as usual. He learned that someone had treated the lawn for mosquitoes. The proverbial light bulb went off and Clark began researching mosquito control as a business opportunity. He learned about Mosquito Joe from his father, who showed him a Kiplinger magazine article about a Mosquito Joe franchisee. Mosquito Joe franchises treat yards with barrier spray pyrethroid insecticides. Clark chose the franchise path because the start-up costs were affordable. “After running the numbers to create new marketing materials and begin branding the business for mosquito control, I could see that it was going to be cheaper for me to buy a franchise,” Clark says. Clark paid approximately $20,000 in franchise fees to get his Mosquito Joe business started. But he estimates it would have cost him approximately $44,000 to market the business if he started his own mosquito-control service. Mosquito Joe’s corporate office provides franchisees with free use of its direct-mail program, which includes a direct-mail list, during the first year. The company also provided Clark with training materials for his technicians and budgeting software. Clark mailed postcards to about 30,000 households in his territory. The postcard provides information on the company’s service along with an introductory offer for a free mosquito-control application. He also uses Mosquito Joe’s online pay-per-click campaign, but so far, direct mail and referrals have yielded the best results. Clark offers his Mosquito Joe customers $25 off from their service fee for referrals. Clark’s Mosquito Joe business logged $110,000 worth of business in the first year, $95,000 after discounts. Clark estimates that he would have likely generated no more than $10,000 in mosquito control business without the marketing help. He based the estimate on growth figures from his lawn care business. His direct mail efforts for Southern Lawn only generated 40 to 50 new customers in the last year. With Mosquito Joe’s direct-mail program, Clark can reach more potential customers because the direct-mail service sends three or more postcards to each address over a wider geographic area, he says. Clark expects his primary business to benefit from the addition of Mosquito Joe. For example, the franchise has favorable pricing contracts with many chemical suppliers, so Clark can leverage that relationship to gain pricing advantages for Southern Lawn. He also expects the two businesses to feed off of each other for new customers. 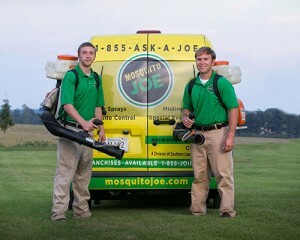 By the end of 2014, he expects to convert about 50 Mosquito Joe customers into lawn care clients as well. Katz is a freelance writer based in Cleveland.